Returning back to some images from our mid-May trip to Yosemite National Park that included a late season snowfall for our last day there. This is Bridalveil Fall, as seen from across the river. The fall was flowing beautifully during our visit. In fact, we got quite wet on the short hike to its base, and you can see the cloud of mist rising above the trees in this image. 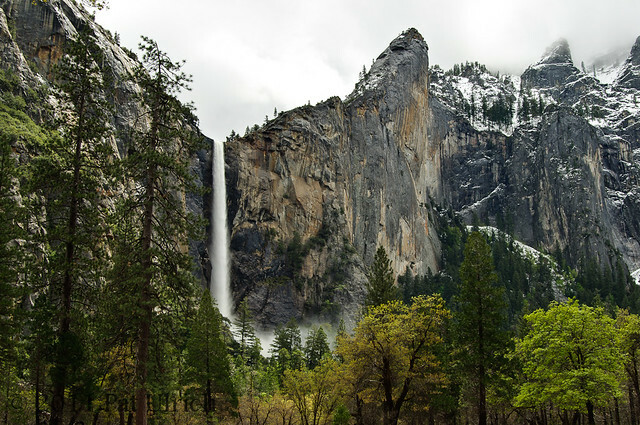 For some perspective, Bridalveil Fall has a height of 620 feet. More images from this trip are in my Yosemite Gallery.